Do you have your own post-'Conjuring' story to share? Please tell us that these tales and videos that reportedly happen after watching The Conjuring 2 are just publicity stunts. And if they are, shame on you, Warner Bros. Pictures. If they aren't, well, we're glad they didn't happen to us. Yahoo! reports the story of a 65-year-old man in India who had a heart attack in the middle of watching the popular horror film. Police say that the moviegoer complained of chest pains and fainted at the climax of the film. He passed away while being rushed to the hospital. The man’s body was then sent to the Tiruvannamalai Government Medical College Hospital for the post-mortem examination, but the corpse never arrived at its destination. Both the cadaver and the person entrusted with transporting it has mysteriously disappeared. Police are said to be on the lookout for the body and driver with no reports of either being retrieved as of yet. Yahoo! themselves have admitted to be skeptical about the whole thing as details are very general. This indeed could be the work of a company trying to drum up extra interest for a movie, but we'll give them the benefit of the doubt—just as we suspend our disbelief for most of their movies. Hey, it's fun that way. 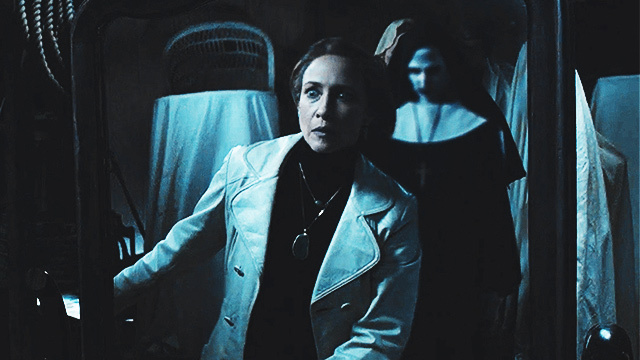 Here's the second tale: Currently making rounds on the internet is a video that shows a woman who was possessed in the theaters while watching The Conjuring 2. As of writing, it has been viewed more than five million times and has more than 109,000 shares. If you read the comments section though, many are quick to point out that the demonic voice may have been just sound effects. Lastly, we've got another viral story. This one is from Damian Ng Yih Leong, who claimed that a spiritual entity drew a cross on the bathroom mirror of their hotel suite in Malaysia at 3 a.m. Hours before, Damian was together with this friend watching The Conjuring 2. His post on Facebook about the event has been shared more than 3,000 times at time of writing. Whether these are fabrications of an overactive imagination or some below-the-radar marketing work for a big company, it's fascinating to see how we're sometimes willing to believe them in order to give ourselves some extra scare. As we've said, you're free to skeptical. But for a little fun, why not suspend your disbelief, and just believe that paranormal shenanigans can happen. What's Culture Club All About?